Autumn is coming and it is almost time to put away swimsuits and flip-flops and pull out jackets and boots from the wardrobe. Autumn is one of the best time to visit Sicily: the milder climate and pleasant temperatures allow visitors to enjoy every minute of the holiday. If you want to live a different experience and discover a new and almost unprecedented side of the Island, immersing yourself in the silence and scents of nature, we suggest you take a look at our selection of the best nature reserves in Sicily. Did you know that Scent of Sicily has a special Autumn Sicily Villas selection? Go browse now our detailed catalogue! Riserva Naturale Orientata Bosco della Ficuzza (Palermo): among the most interesting naturalistic paths in the province of Palermo, the Riserva Naturale Orientata Bosco della Ficuzza, Rocca Busambra, Bosco del Cappelliere e Gorgo del Drago surely deserves a special treatment. A protected area of ​​about 7,400 hectares which covers the territories of Corleone, Mezzojuso, Godrano, Marineo and Monreale, some of the most beautiful Sicilian villages. The Reserve is the wonderful habitat for over a thousand species of plants and animals, such as foxes, weasels, wolves, hedgehogs, wild birds and predators. 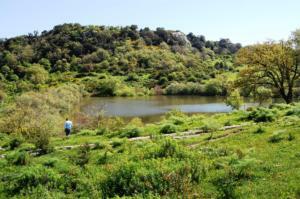 Bosco della Tassita (Messina): it has one of the highest botanical, scenic and cultural value among those in Sicily. Located inside the wonderful Nebrodi Park (north-eastern Sicily), the Tassita is immersed in a unique geological context, a place of enchantment but easy to reach and suitable even for the first-timers. Moreover, beeches, monumental maples and holly, in a undergrowth rich in mosses, shrubs and herbaceous vegetation, as well as particular limestone rocks. Parco Avventura Madonie (Petralia Sottana – Palermo): the first and only Adventure Park in Sicily was opened in 2008 in Petralia Sottana, in the heart of the Madonie Park, 110 km away from Palermo. The Madonie Adventure Park is a new, fun and safe way to approach to nature, learning to discover it and respect it. The Madonie Adventure Park offers the chance to try new and exciting experiences and outdoor fun activities. Inside the park facilities, the visitor can compete with exciting acrobatic courses in height, exciting mountain bike trails, sensational tactile routes, orientation competitions and nature excursions. Riserva del Pino d’Aleppo (Ragusa): the Reserve of Pino d’Aleppo with its 3000 hectares rises between the Ippari and Acate rivers, in the territory of Vittoria, Comiso and Ragusa, south-eastern Sicily. Located between the town of Vittoria and Santa Croce Camerina, the Nature Reserve hosts the last settlement of Pinus halepensis (Pino d’Aleppo) in Sicily, a particular and enchanting evergreen conifer. Approaching to the sea instead, it is easy to find several fascinating plant varietes.